Used for aspiration biopsy. Supplied sterile in peel-open packages. Intended for one-time use. 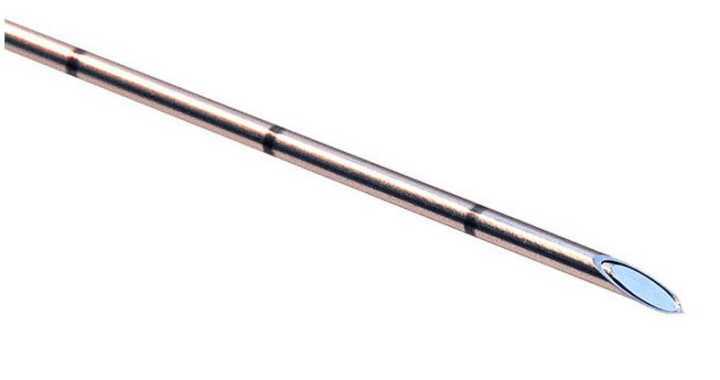 Can be considered as a Universal Needle Used for Percutaneous Nephrostomy procedures, Cytological biopsies, needle-aspirations, thoracentesis exploratory punctures, to inject contrast dyes etc. The Chiba point enables soft penetration and avoids the risk of vessel laceration and reach deep points without any excessive deviation. The special echo-sensitive tip increases the visibility under ultrasound guidance and guarantees the needles point localization.